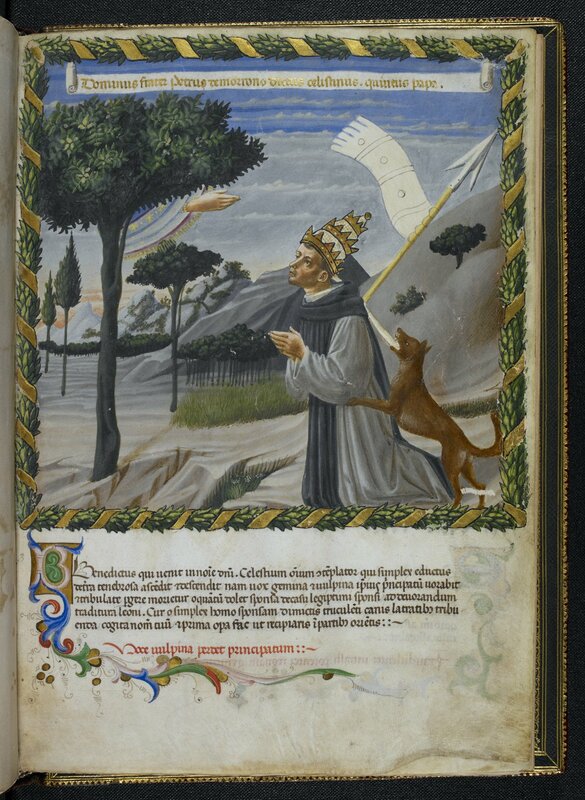 It’s been interesting to see scores of religious commentators draw comparisons to Pope Benedict XVI’s resignation (effective later today) and that of the next-to-last Pope to resign, the briefly-reigning St. Celestine V, who served for five months in 1294. Celestine’s renunciation is indeed a much better comparison than that of Gregory XII, whose 1415 abdication was coerced by the power politics of the Western Schism, for a number of reasons. Even though the two popes are separated by the centuries and their records of service to the Church, they might have been of like mind in their mutual desire to retreat from the very worldly powers and obligations of their office. Celestine V: British Library MS Harley 1340, attributed to Joachim of Fiore, mid-fifteenth century. In his statement of renunciation, Benedict expressed his desire “to also devotedly serve the Holy Church of God in the future through a life dedicated to prayer”, which was also the stated goal of his predecessor, who went further: “I Celestine V, moved by valid reasons, that is, by humility, by desire of a better life, by a troubled conscience, troubles of body, a lack of knowledge, personal shortcomings, and so that I may proceed to a life of greater humility, voluntarily and without compunction give up the papacy and renounce its position and dignity, burdens and honors, with full freedom”. These men were roughly the same (advanced) age, so I am certain that “troubles of body” have a lot to do with both of their abdications. And they were both reluctant Popes, Celestine even more so than Benedict. 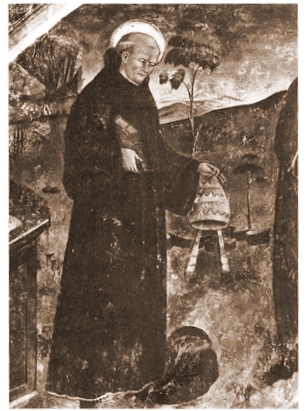 The so-called “hermit-Pope” was the founder of an order of friars that bore his pontifical name, and he was more comfortable in their company than in Rome. While the reactions to Pope Benedict’s resignation strike me as largely positive, this was not the case with Celestine’s: he was labeled cowardly, a characterization that was reinforced by Dante’s Inferno, which refers to the shade of him who in his cowardice made the great refusal. Dante’s anger derives from his hatred of Celestine’s successor, Boniface VIII, who many believed manipulated “the great refusal”. 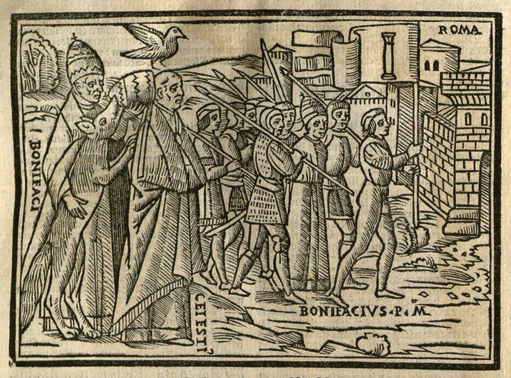 The Liber Sextus: Sextus decretalium liber a Bonifacio viii in concilio Lugdunensi editus (Venice: Luca Antonio Giunta, 1514), Courtesy Lillian Goldman Library, Yale Law School. Boniface’s foxy fox is pulling the papal tiara off Celestine’s head, while the holy dove flies above the latter’s head. Among his contemporaries, there were those who also admired Celestine’s retreat from the world, and he was canonized in 1313 for his piety. During the Schism and after, when the Church was perceived as being corrupt and over-worldly,Celestine and his renunciation were increasingly depicted in a more positive light, both by theologians and artists, who depicted the resigned Pope as the very image of humility, in the plain grey robes of his order with the papal tiara in his hand (or on the ground) rather than on his head. 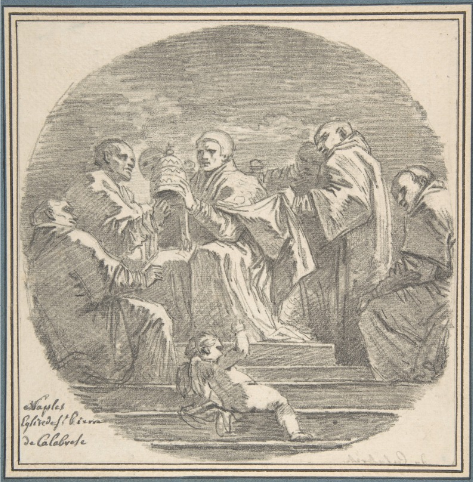 St. Celestine, the hermit-Pope; Jean Honoré Fragonard, Saint Celestine V Renouncing the Papacy after Mattia Preti, 1761. Metropolitan Museum of Art. Beyond the label Popes who quit, there are a few more connections between Celestine V and Benedict XVI. After the devastating L’Aquila earthquake in 2009, the present (just) Pope visited the Abruzzo region, from where Celestine hails and where he is venerated as a saint. The purpose of Benedict’s visit was clearly to comfort the inhabitants of the region in the wake of the quake, but while he was there he also made a point of visiting sites associated with Celestine, including his tomb (miraculously intact in the midst of the severely-damaged Basilica Santa Maria di Collemaggio in Aquila), where he left his inaugural pallium (a vestment, or “stole of honor” and symbol of papal authority), apparently a gesture of great significance. 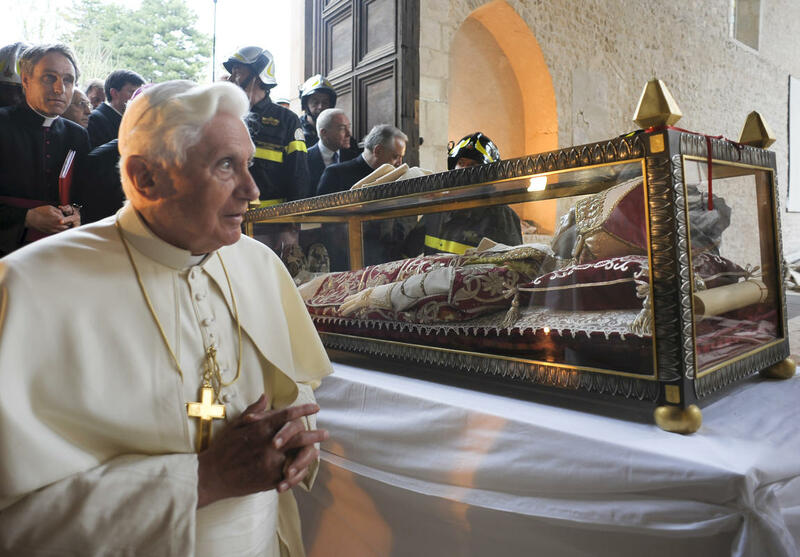 A year later, to mark the 800th anniversary of Celestine’s birth, Pope Benedict visited his reliquary at nearby Sulmona Cathedral, towards the end of his proclaimed “Celestine Year”. This is reverential treatment of a retreated Pope, by one who is now retreating himself. Benedict XVI and Celestine V, 2009. Associated Press/Boston Herald. 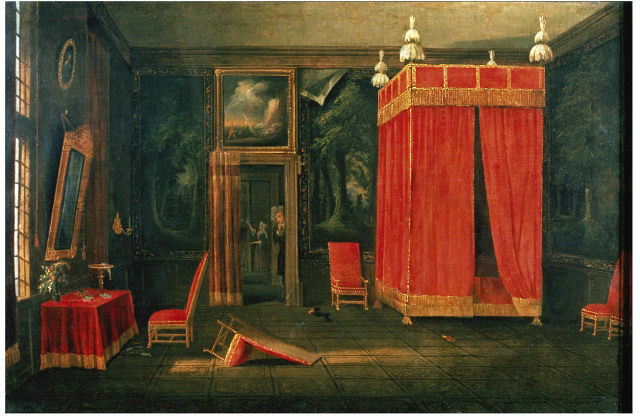 I’ve been spending a lot of time this past week looking at two pictures of bedrooms: we’ve been examining the justly-famous Arnolfini Portrait in two of my classes, and then I came across a painting of a mysterious bedchamber by an anonymous artist when I was (of course) searching for something else entirely: what’s going on here? Actually, what’s going on in both paintings? Bedroom scenes are pretty provocative. Scene in a Bedchamber, Unknown Artist, c. 1700, Victoria & Albert Museum; The Arnolfini Portrait, Jan van Eyck, 1434, National Gallery, London. I’ve got very little information on this first painting, so it invites speculation and many return visits. We have a well-appointed bedchamber in which something has happened: is the person in the doorway looking at the remains of the night before? A chair has been overturned, a little dog is running towards the door with a slipper in his mouth, wallpaper in peeling off the wall, cards are on the dressing table. Some sort of wild card party in which someone lost his/her shirt, or at least a slipper? I’m not sure if anyone is actually in the bed; we can’t quite see in there. 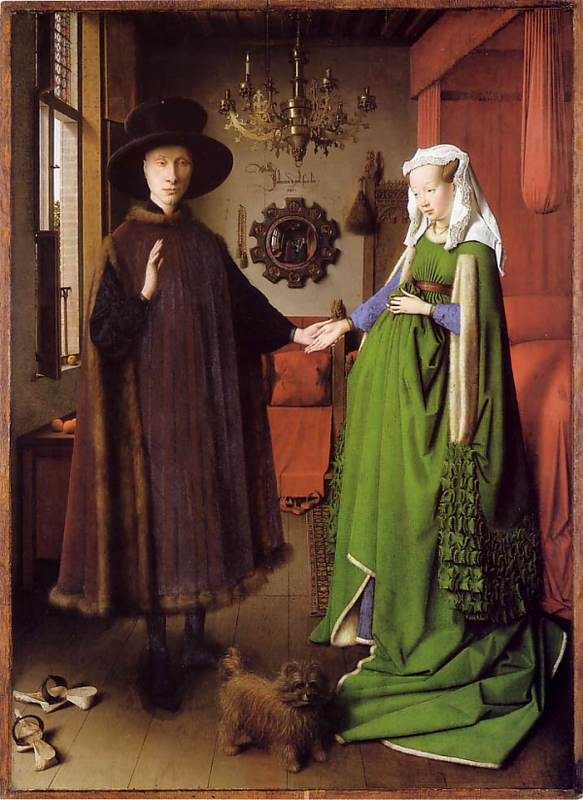 I’ve got too much information on the Arnolfini portrait but it remains somewhat enigmatic: ostensibly it is a double portrait of Giovanni di Nicolao Arnolfini and his wife, but at what stage in their relationship/lives? Is this a betrothal portrait, a wedding portrait, or perhaps a memento mori? Does the woman’s apparently-expectant appearance represent fertility (along with the symbols in the room) or is it just a fashion statement? Like the painting above, we have a rather flagrant display of wealth here: Arnolfini was a member of a wealthy Italian merchant family living in Bruges and he looks the part. And who are those figures in the doorway, reflected very cleverly in the convex mirror? We have a dog and slippers here too! 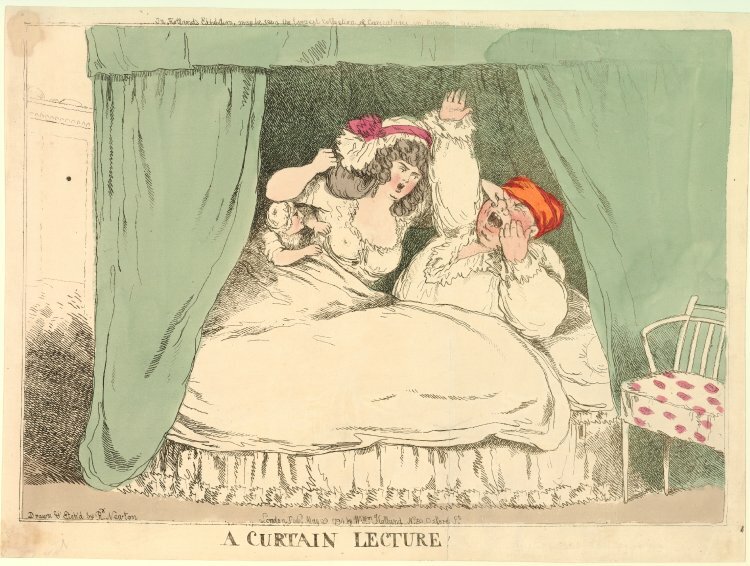 Scenes of curtain lectures purport to give us a little bit more information about what’s going on behind those bedclothes, but they are really just commentaries on nagging housewives. From its first use in the seventeenth century, the phrase referred to those moments after the curtains had been drawn and the wife would berate her (poor) husband with all the pent-up demands of the day, until he (mercifully) fell asleep. Two Curtain Lectures: Thomas Heywood. A curtaine lecture. London, 1637 (STC 13312); Richard Newton print, London, 1794, British Museum. 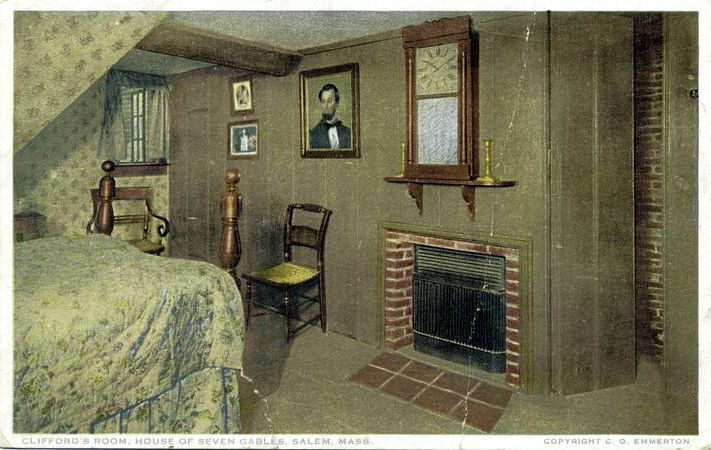 Rather less compelling, but still interesting to me because they are both so staged, are two Salem bedroom views published by Detroit Publishing Company in the first decade of the twentieth century: one is a “New England Bedroom c. 1800” and the other is “Clifford’s Bedroom” in the House of the Seven Gables. I’m not sure where the first one actually was, but the Essex Institute retains the copyright, so I assume it is one of George Dow’s period rooms (the first in the country). I love the fancy chairs in Clifford’s room at the Gables, and the portrait: Abraham Lincoln? These two cards much have had a huge print run, as I see them everywhere. Back across the Atlantic, to a painting that was produced around the same time as these postcards. 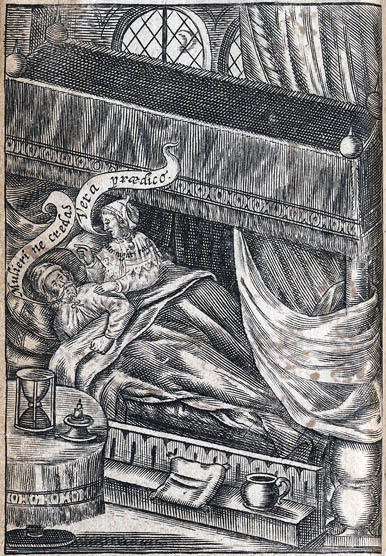 Again, this image has captured my curiosity as I can’t figure out what is going on between these three people in the bedroom. And that bed and their shoes! Like the painting at the beginning of the post, I think a creative person could conceive a complete sketch–perhaps even an entire novel–around just this one scene. Or just a funny caption. 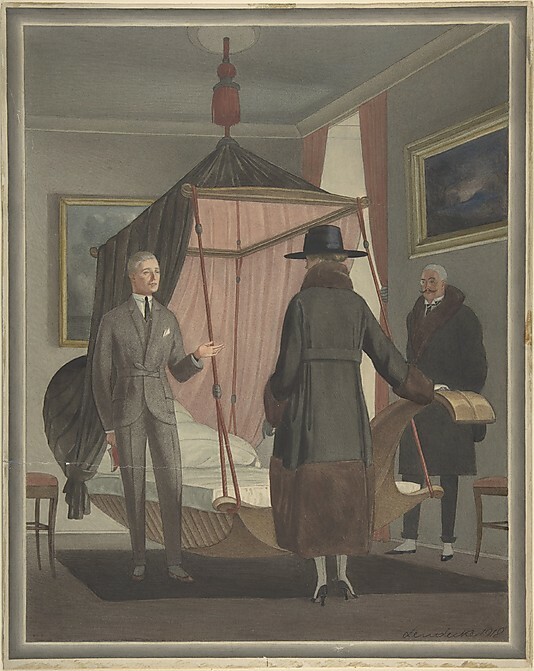 Two Men and a Woman in a Bedroom, Otto Friedrich Carl Lendecke, 1918, Metropolitan Museum of Art, New York. This has been quite the year for historical movies: the majority of best-picture nominees are set in the past, even if it’s the relatively recent past of Argo and the very recent past of Zero Dark Thirty. 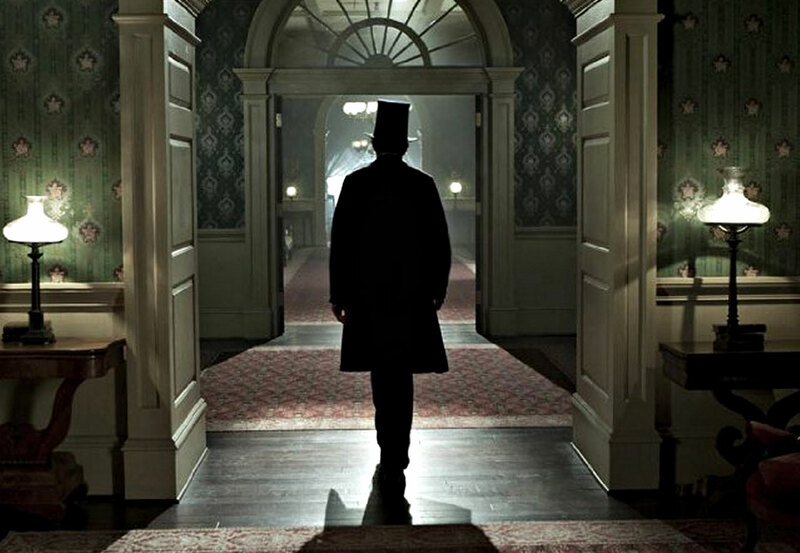 In addition, there has been lots of discussion about the historical accuracy of these films which, while occasionally interesting (particularly the Connecticut v. Lincoln controversy, initiated when Connecticut congressman Tom Coutenay criticizing the film for its portrayal of two fictional Connecticut congressmen voting against the 13th amendment when in fact all four congressmen from the state voted for the amendment outlawing slavery) is hardly news. All historians know that “historical” films are never accurate, but I, for one, still have my favorite films set in the past. I like these films for various reasons– the feelings they provoke, the certain aura or spirit that they might capture, the way they look, the performances, the soundtracks– but I rarely learn anything from them. There are some films that I like to show in class just because they provide a lesson in just how inaccurate “historical” films can be! So, in honor of Oscar night, here are my top ten period films, in chronological order of setting. I’ve left out the major epic movies, most of which I do not like either as movies or history, in favor of “smaller” films that are personal favorites. And remember, I teach medieval and early modern history, so most of my films come from these eras: sorry, no World War II films, guys (I actually like war films, but I’m more of the Mrs. Miniver and Best Years of Our Lives type, with the exception of submarine movies, which for some reason I adore. If I could add an eleventh film, it would be Das Boot). The Thirteenth Warrior (1998): this film was a financial and critical failure, but I like it, or parts of it. Based on Michael Chrichton’s novel Eaters of the Dead, the plot is a curious combination of Beowulf, pre-Christian Scandinavian culture, and a real early medieval source: the Risala of Ibn Fadlan, the chronicle of a 10th century Arab diplomat who journeyed to eastern Europe and Russia and encountered the Vikings along the way. Valhalla Rising (2009): an extremely atmospheric film in which a one-eyed Norse warrior (Odin?) and his child companion go on a mysterious journey, and end up in the New World. They come out of the fog into a dramatic encounter with Native Americans (apparently played by Tibetans) at the very end of the film. This is not an easy film, but its marriage of mysticism and blind faith are pretty compelling. The Seventh Seal (1957): Ingmar Bergman’s classic film about a returning Swedish (again–I didn’t realize I was so obsessed with Scandinavia before writing this post!) 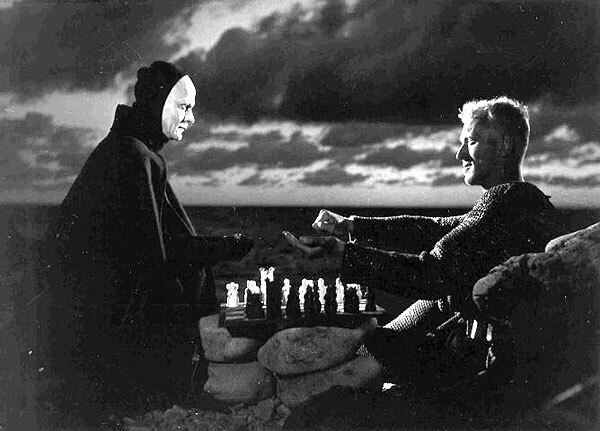 Crusader’s encounter with the Black Death and Death Personified, with whom he plays chess intermittently throughout the films until Death wins. The scene in which the knight and his companions wait for death/Death at dinner in his castle is haunting, as is their “Dance of Death” at the very end of the film. This is one of the few films which I try to show in its entirety in class, rather than just clips, and the students usually get (into) it. A Knight’s Tale (2001): and on a much lighter note………….you might be surprised to find this film on my list but I love this film’s spirit as well as its use of very deliberate anachronisms. I like to think of Chaucer’s world this way. You can’t recreate the fourteenth century on film anyway, so you might as well have fun! Henry V (1989): this is my favorite Shakespeare film as well as my favorite Kenneth Branagh Shakespeare film. The St. Crispin’s Day speech is of course extremely inspiring, as is the score by Patrick Doyle, most especially the choral epilogue at the end of the Battle of Agincourt: “Non Nobis, Domine”. Most students have a rather romantic view of medieval warfare, which the long and bloody battle scene helps to dispel. The Passion of Joan of Arc (1928): it is difficult to over-emphasize the power of Carl Theodor Dreyer’s film, which narrates the examination, trial and execution of Joan of Arc in 1431 through extreme close-ups of the participants, warts and all. The master negative of the film was destroyed in a lab fire only a year after its release, and so the complete film was lost for decades, until a copy was miraculously found in the closet of a Norwegian mental hospital in the early 1980s. The DVD release in the 1990s includes an oratorio by Richard Einhorn called “Voices of Light” which actually makes the silent film even more compelling, but the real star of the production is actress Renée Jeanne Falconetti, who appears to be in a near-ecstatic state for most of the film, as if possessed by Joan. 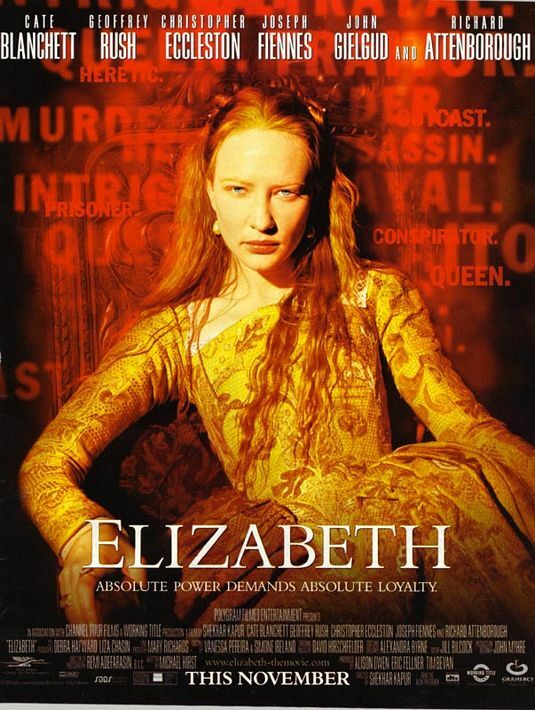 Elizabeth (1998): this film is a historical hot mess which plays with chronology and the facts with abandon—and the sets are terrible. Nevertheless I do like Cate Blanchett’s characterization of the young Elizabeth, and the movie is useful to me as I can teach against it. 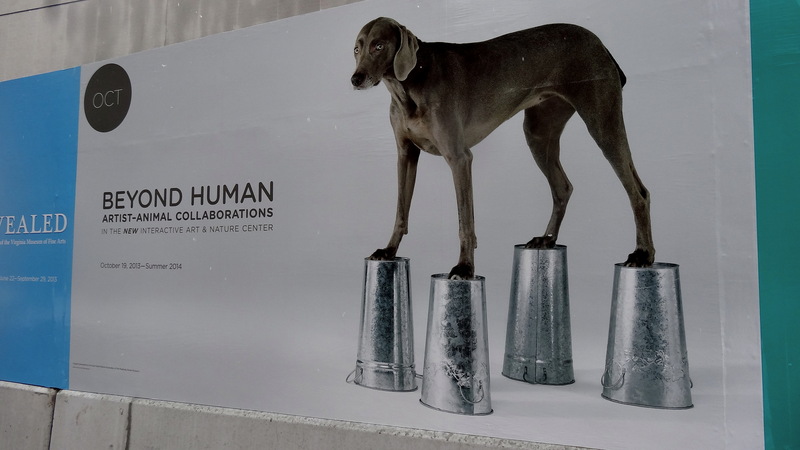 I really like the poster too: I have framed versions in both my university and home offices. 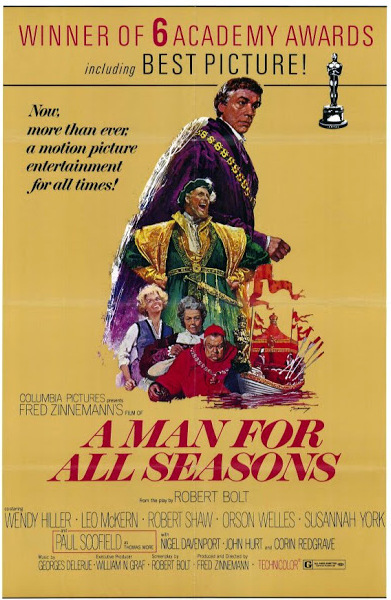 A Man for all Seasons (1966): now here is an example of much more subtle anachronism, with Thomas More not only deified for his faith, but also for his individualism. There were so many English “historical” movies made in the 1960s (The Lion in Winter, Becket, Anne of the Thousand Days, Mary Queen of Scots, Lawrence of Arabia, etc…) that I felt that I should include one, and More’s struggle between conscience and obligation to Henry VIII is universally appealing. Paul Scofield as More and Richard Shaw as Henry VIII are both great; in fact, Shaw is probably my favorite screen Henry VIII. If I show clips in class, however, I feel that I have to balance the film’s portrayal of More’s resolute passage to martyrdom with his zealous persecution of Protestants. The Madness of King George (1994): a very entertaining presentation of King George III’s descent (and recovery) into a porphyria-induced insanity in the late eighteenth century, and the ensuing Regency Crisis. The actual events seem to be accurately, albeit dramatically, portrayed, but this is not really my period so I can’t critique accuracy; I’m just entertained. Nigel Hawthorne as King George is amazing in this film; he was robbed by Forrest Gump of the Oscar that year. 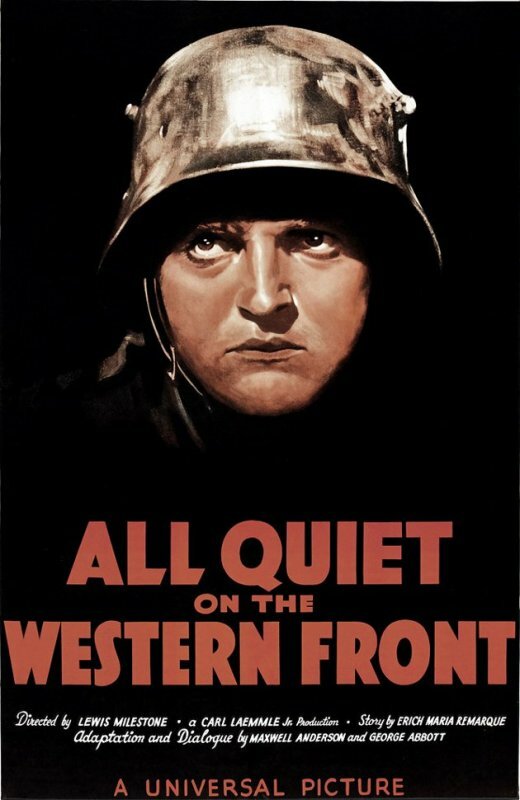 All Quiet on the Western Front (1930): an extremely powerful view of another descent, of innocent, whipped-up German boys into the hell of World War One. This film was on TCM several weeks ago and I sat watching it, riveted, even while it was extremely difficult to do so. I think this movie benefits from its age; you can tell that it was made by the same generation that experienced the first World War. And of course all the battle scenes would be computer-generated if the film were made today, which would transition it into video-game territory and rob it of its humanistic power. So there you have it: my top ten list of historical films–for now. This was tough; I think I would come up with a different list next week, or maybe even tomorrow. All comments and suggestions are more than welcome (even for war films): the list is always subject to substitutions. Our house is part of a double house, in which a central party wall divides two autonomous units, a not-uncommon configuration in historic urban areas, large and small. Though, as you will see in my pictures below, double houses are not exclusively urban constructions. I love living in our half of the double house, primarily because we have great neighbors, but also because there are no restrictions on privacy and lots of economic benefits which derive from the common wall: I am certain that the heating bills for my very large house would be a lot higher without it! Our particular property has very private spaces out back as well, as the previous owners of my house (several previous owners ago) extended an addition to my neighbors’ barn, creating separate courtyard gardens on each side. While our houses started out as mirror images of each other, many changes have been made over the nearly 2 centuries of the building’s existence, mostly to my side. Even though they are semi-detached (to use the British term), we could even paint our houses different colors if we wanted to (but we don’t). It seems that every double house has its own story: many were built by and for family members, but not all. 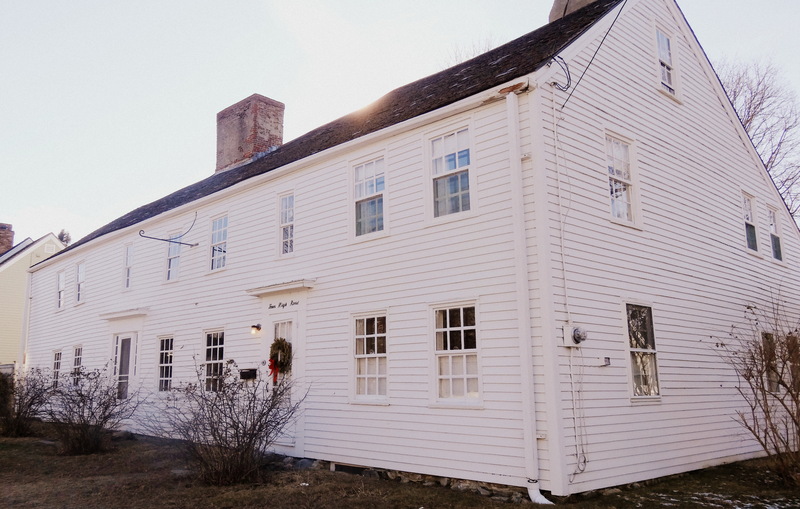 Here in Salem, there are several instances of fathers constructing double houses for their marrying daughters (in one case, daughters who are marrying brothers!). There are also business partnerships behind the construction of double houses. 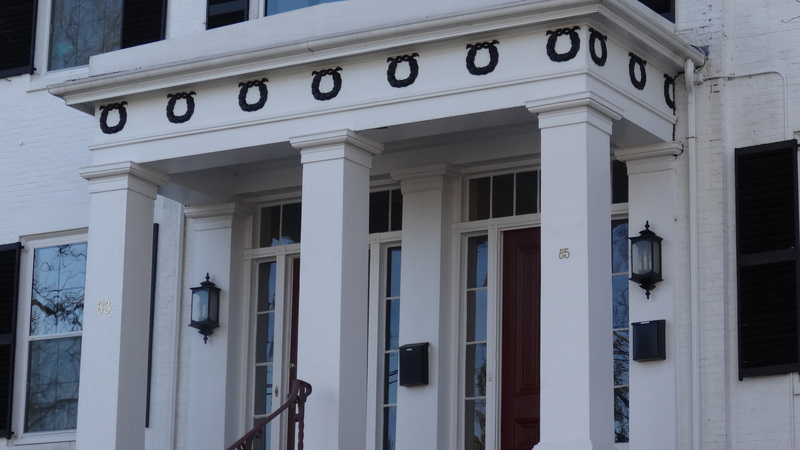 Here on Chestnut Street and in the surrounding McIntire Historic District, I think builders were running out of land on which to build, and double-house construction offered an economic way to build two houses in a fashionable neighborhood. I know that’s the story with our house, which was built by the distiller-developer Deacon John Stone who lived across the street: he bought the lot as an investment, and constructed our house as an investment property, to be let out on both sides. Quite soon after its erection, both sides of the house were sold to different families, and then its separate-but-connected history began. Some double houses were converted from single houses; some single houses were extended to become double houses. 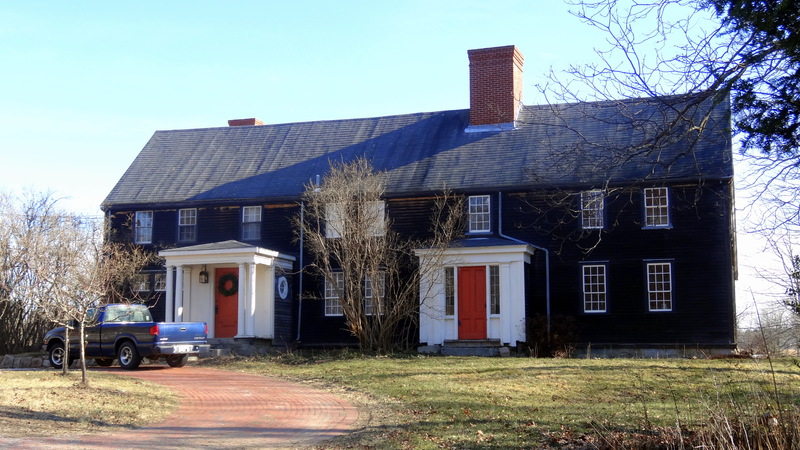 My favorite double house (besides my own, of course) is not in an urban setting or even in Salem: it is in Byfield, Massachusetts, on a rural country road. I don’t know anything about its construction, but the fact it is built in the midst of isolated farm/marshland leads me to believe there was a family connection; I can’t imagine strangers living side by side but maybe its dwellers were looking for close comfort. 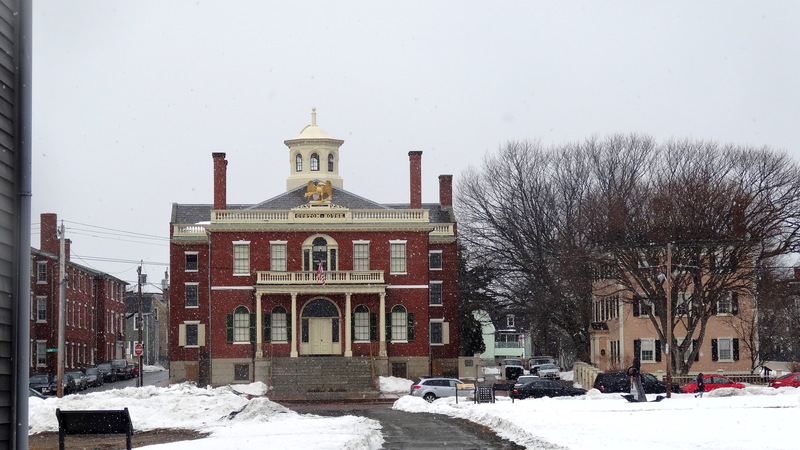 On the day before the big snowstorm a couple of weeks ago, I was up in that part of Essex County, so I took some pictures of the Byfield house and some other double houses in nearby Newburyport, Newbury and Essex. 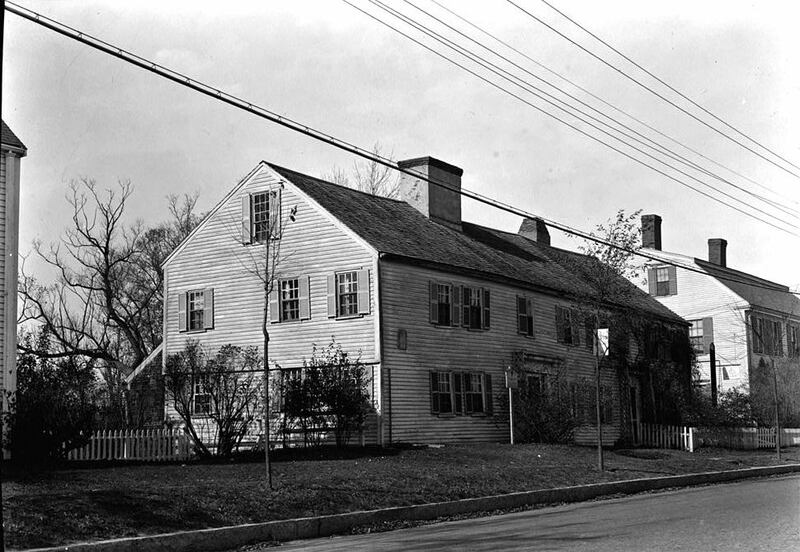 Double House on the Marsh, Byfield, Massachusetts, the former Newburyport Academy on High Street in Newburyport, converted into a double house in 1842; the Swett-Ilsley House (Historic New England), which began its life as a single house in 1670 and then was extended (HABS photograph from 1940, Library of Congress); a double house in Ipswich. 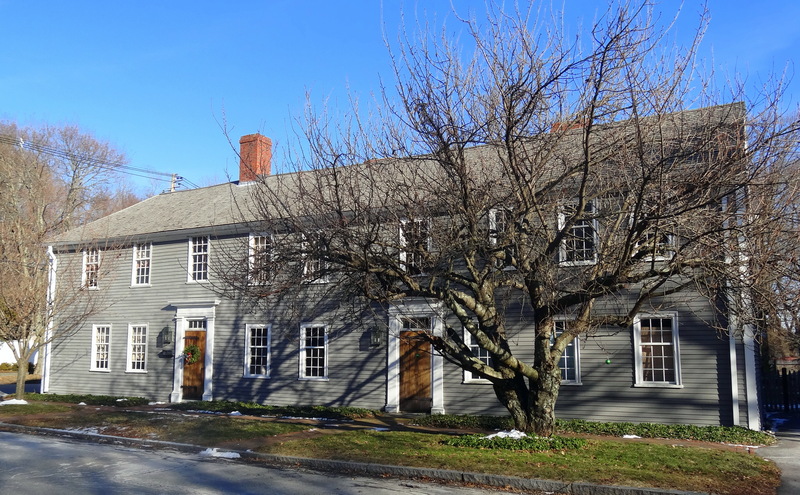 Double houses in Salem are for the most part more straightforward constructions, but as is the case with our house, changes to the exterior on one side or another over time distort the mirror image, but usually in a relatively graceful way. There are lots of added bay windows and rear and side additions. I’ve don’t have any interior images today, but the comparative interiors of a double house often provide an interesting lesson in architectural history; generally one side is a bit more pristine and the other a bit more “modern”. 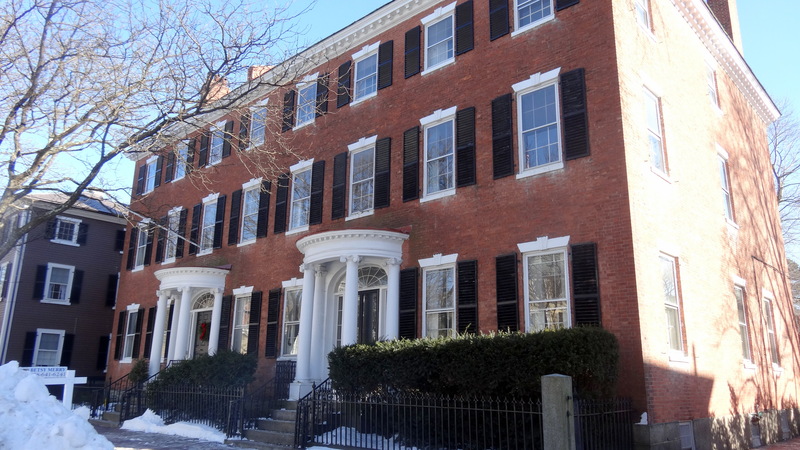 There are lots of double houses in Salem, in every area of the downtown, so I chose a chronological sampling of those in my immediate neighborhood, and I’m picturing them in chronological order, starting with the Pickering-Mack-Stone double house on Chestnut Street, which was built in 1814-15 for two Pickering brothers. 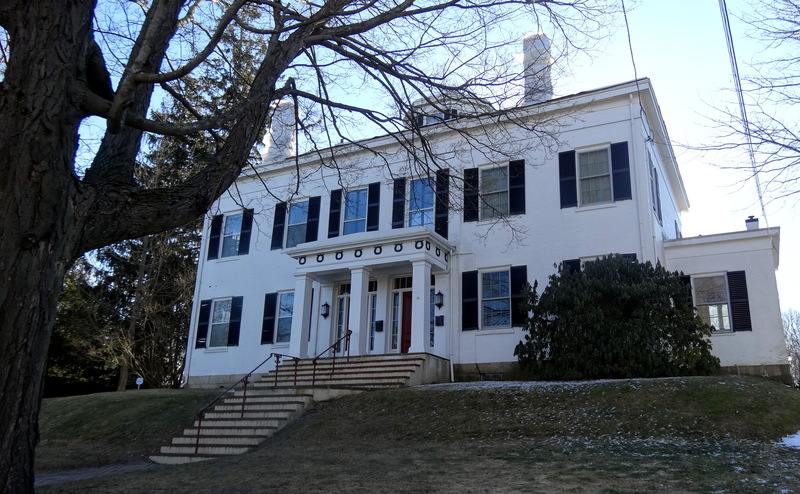 The western (right-hand) half of this house is currently for sale: it has absolutely beautiful “bones”, a Federal carriage house out back, and, according to Bryant Tolles’ Architecture in Salem, Andrew Jackson was entertained there in 1833 on a presidential visit to Salem. Frank Cousins photograph of Chestnut Street in the 1890s, New York Public Library. 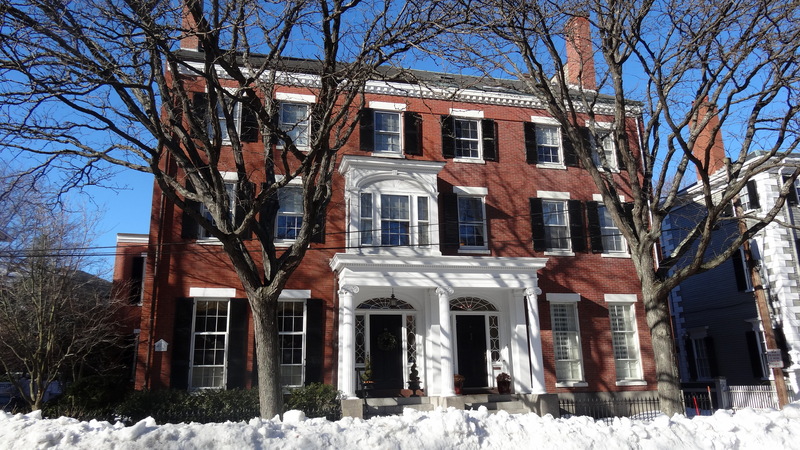 Next are two great Greek Revival double houses, the Thompson-West double house, built in 1845-46 on Chestnut Street (note the entrance bay window added to the left-hand side later in the nineteenth century), and the Nancy Courtis double house, built in the following year on Federal Street. Miss Courtis was a “singlewoman” who built the house and lived on one side her entire life while leasing out the other, no doubt a convenient arrangement for her. It’s a striking house, made all the more so because of its paint scheme. And last but certainly not least, two Victorian double houses in the same general area. I’m really not sure about the date of this first house, which is further along Federal Street from the Courtis house: it looks like it was built in the 1850s or 1860s to me, but I could be wrong. I wanted to include it because of its doorways, which are not located adjacent to each other but at opposite ends of the building. 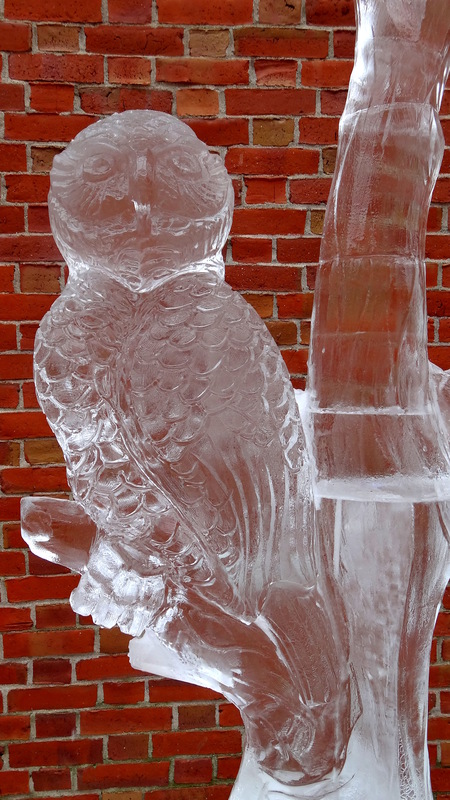 This seems a bit unusual to me, especially for a town house. Both sides of the house have their addition wings off the side,and matching dormer windows as well. 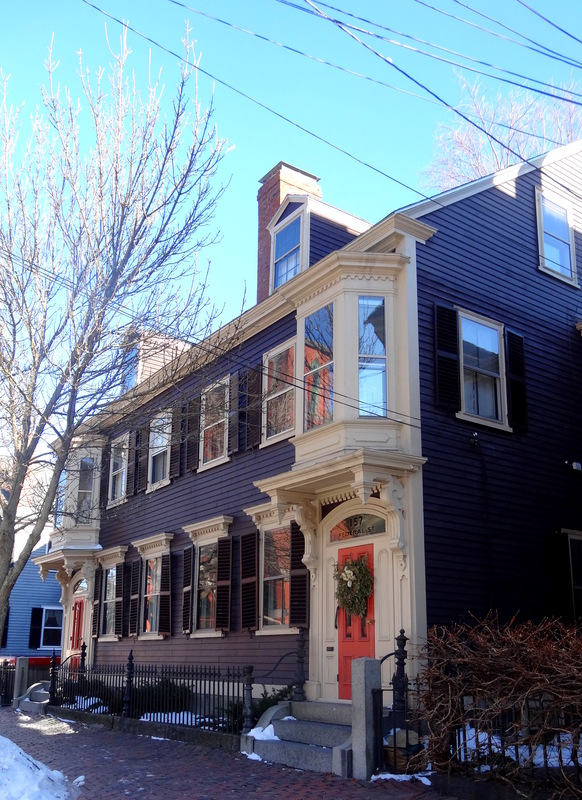 The paint color (a very dark purple with salmon-orange doors) makes this house really stand out on the street. 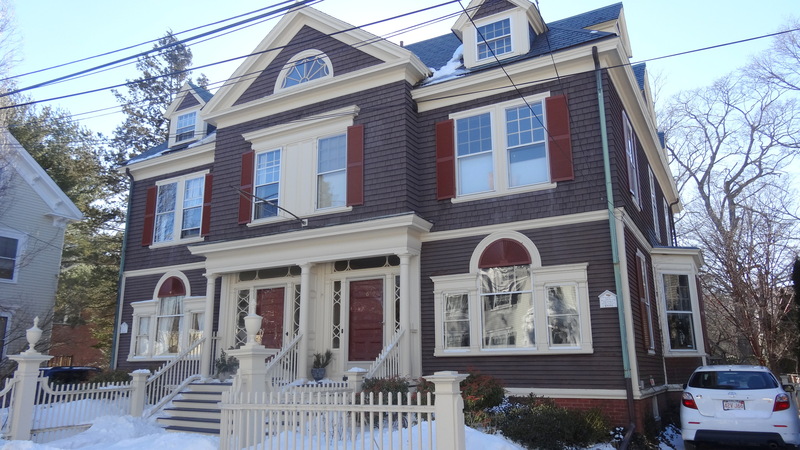 The last house, on Hamilton Street, was built in 1890 for the Reverend James Potter Franks, long-time rector at Grace Episcopal Church around the corner, and his daughters. The gabled entrance really stands out on this house; it is clearly the result of deliberate design rather than organic evolution. 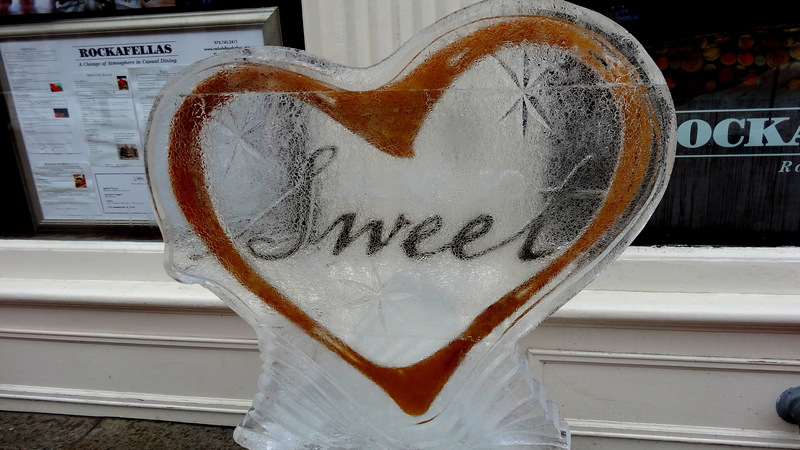 For me (so far), blogging is a remarkably easy, even effortless activity; every post comes from 1) a walk or a drive; 2) a glance at the calendar; 3) reading–either for pleasure or class preparation; 4) looking at art-again, either for pleasure or class prep; and 5) stumbling around the web. 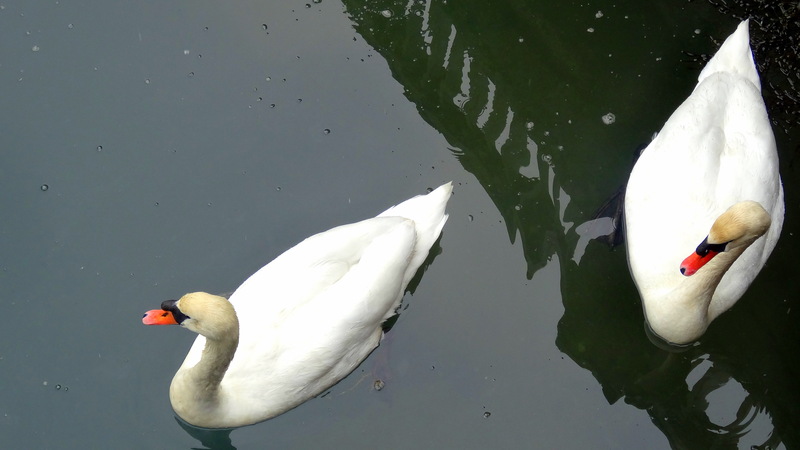 Since I do all of these things daily blog posts naturally follow, without much consternation. 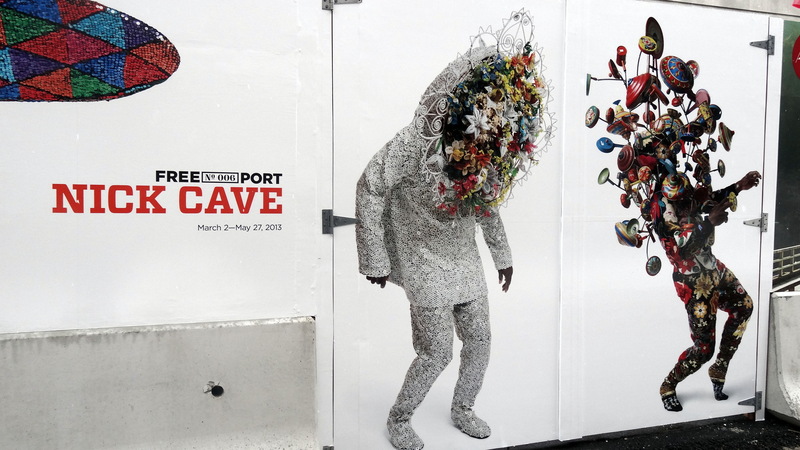 But there is one more source of inspiration that is a bit less immediate: my digital folders of things (images, articles, news items) that catch my interest but are so singular that they don’t really call to mind some larger topical theme–even one sufficient for a fleeting post. Most of these items have no context, but if you keep collecting them, patterns emerge. A good case in point is my rather bulging (if digital files could, in fact, bulge) file which I have labeled “Fading Salem”. 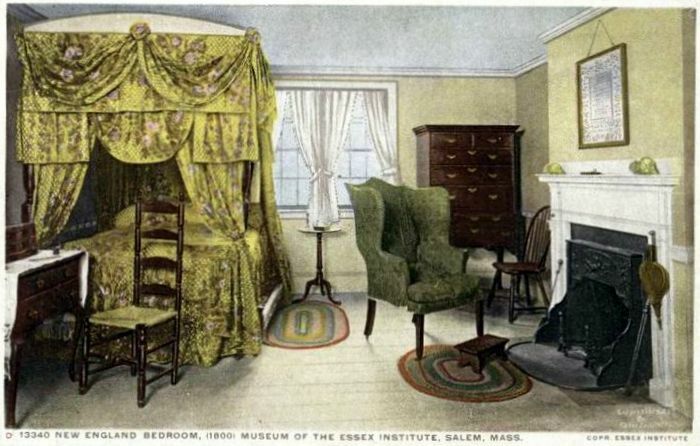 In this file are a number of items and articles from national periodicals about how far Salem has fallen from the glorious heights of its commercial ascendency at the beginning of the nineteenth century. 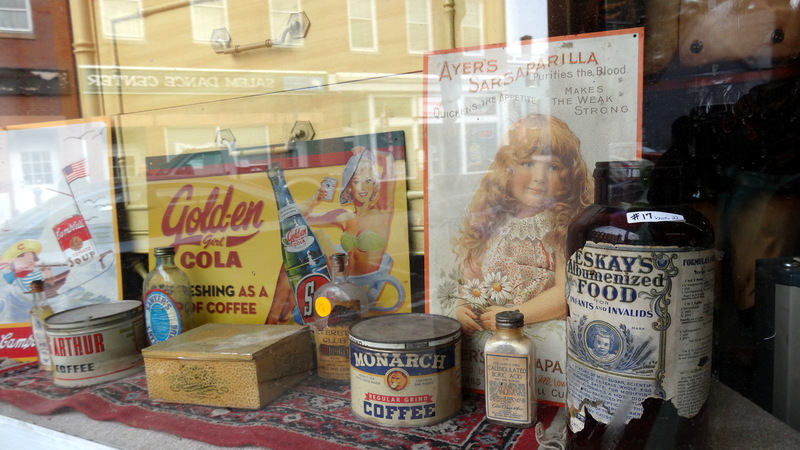 These items all date from the period 1850-1914: the end date does not refer to the beginning of World War I (as it would for the rest of the world) but rather to the Great Salem Fire. There are references to crime and poverty, general malaise (one item is even titled “Dull Salem”) and the faded grandeur of “old Salem”. 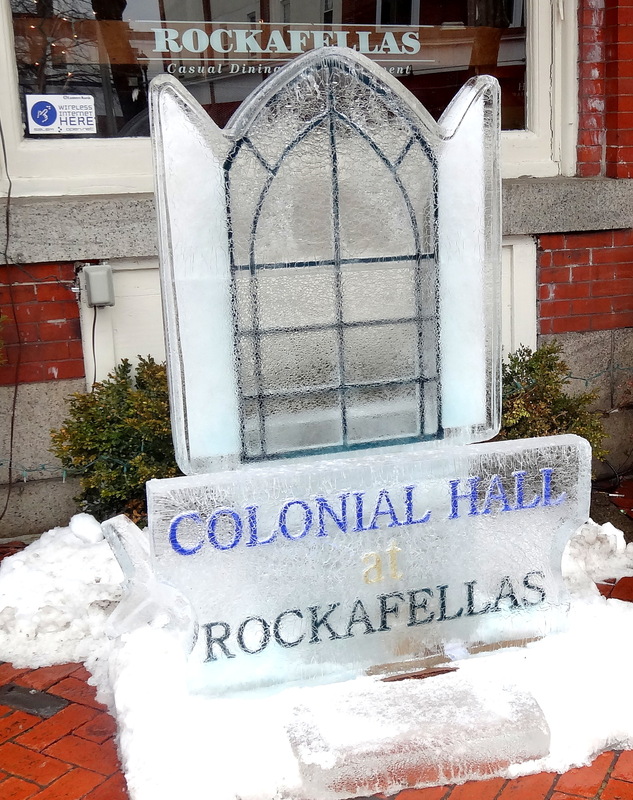 As the century turns, there is definitely an emphasis on the latter: rather than looking at Salem as in decline, a succession of observers note how well-preserved it is, and how it serves as a bastion of tradition in a rapidly-changing world. 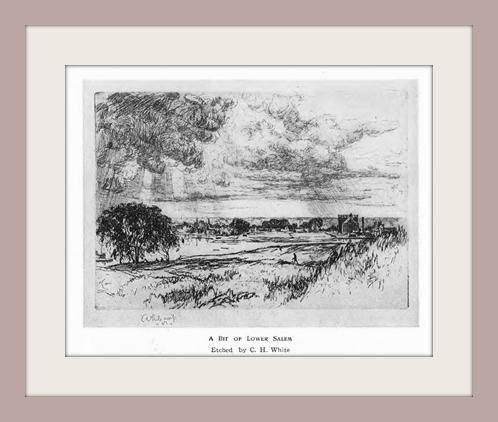 There is one article that captures this transition perfectly, written and illustrated by a Canadian-born artist named Charles Henry White and published in Harper’s Monthly Magazine in June of 1908. 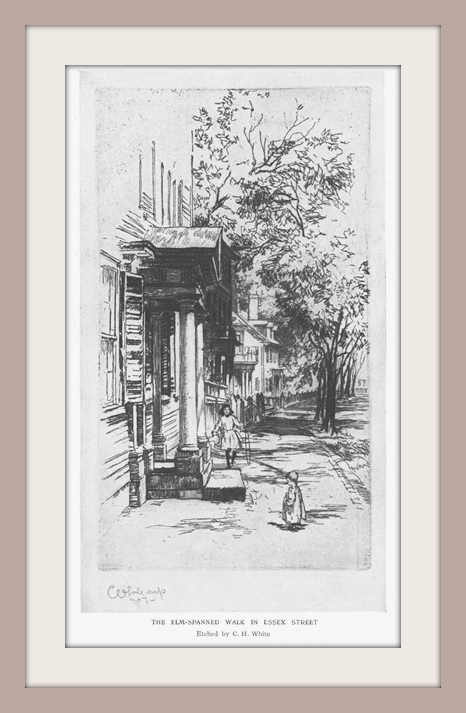 White (1878-1918) traveled around the country sketching and writing little impressions of a host of American cities for Harper’s in the first decade of the twentieth century; before he came to Salem he had produced articles on New York, Pittsburgh, Chicago, Charleston, Richmond, New Orleans, Boston and Philadelphia, and his view of Washington D.C., “Queer Folk at the Capital”, came a year after his “Salem” article. Just before the war broke out, he was off to Europe, where he eventually died in 1918 at age 40. White starts out with the traditional late-nineteenth century impression of Salem: As you center Derby Street on your way to the Custom House, where, in more prosperous times, the main current of the commercial life of the city ebbed and flowed, making the streets ring with the cheerful din of business activity, and reach the deserted quays, you feel not unlike a stranger who has wandered into an abandoned theater and walks alone across the stage, picking his way gingerly through the tattered scenery, long after generations of actors who made the place echo with their laughter have departed. Frankly, his writing is a little dramatic for me but I do like his accompanying illustrations. C.H. 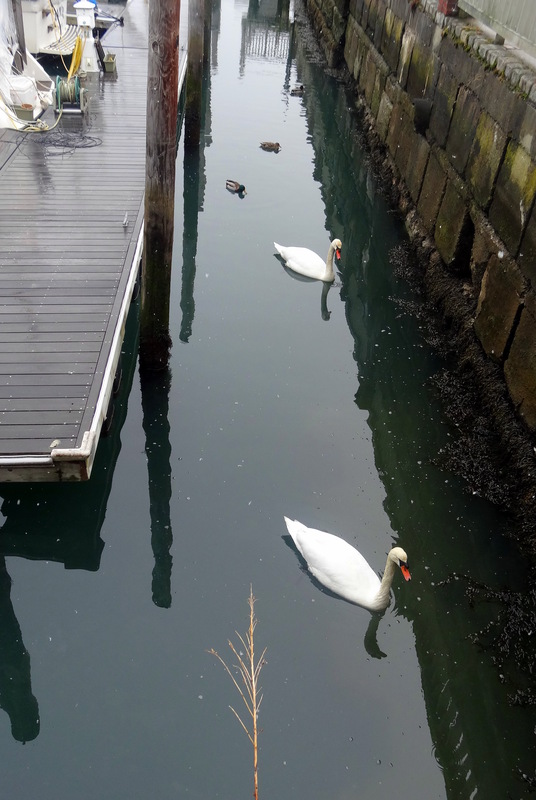 White, “Deserted Quays once Redolent with Foreign Spices”, 1908. 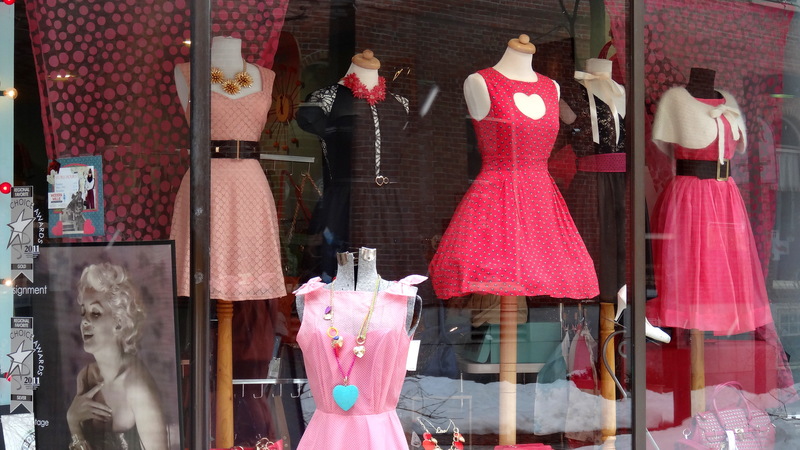 As he strolls around town, it does not take long for White to discover a more charming Salem. Just a step away from the rotting wharves, he finds himself continually stumbling across eloquent reminders of past splendor in the numerous old mansions of former Salem merchants, still marshalled in broken line, looking seaward, with their graceful porticos tufted with ivy, fluttering in the clear sunlight……and he goes on and on: the streets, spanned by titanic elms, become cathedral naves; and through the lofty arch of whispering foliage steal at infrequent intervals into the cool depths below shafts of limpid sunlight, sifting across the splendid rows of Colonial mansions….and I could go on and on quoting him, but you get the general idea. And again, I think his etchings are more eloquent. C.H. 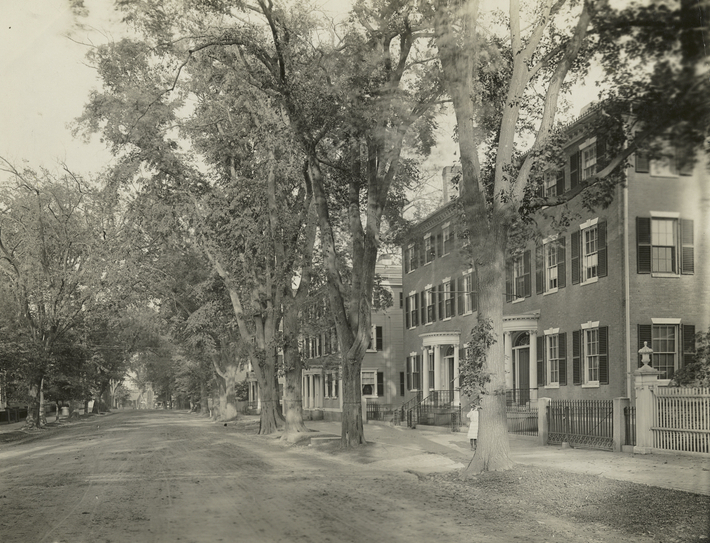 White, views of Chestnut and Essex Streets, Salem, 1908. Fortunately few of the stately mansions that White alludes to throughout his piece were swept away by the fire a few years later; but much later in the century the “titanic elms” were of course decimated by Dutch Elm Disease. So there is an aura of bittersweetness when one reads his words with the benefit of hindsight, knowing what was on the horizon for those trees, for Salem, for the world, and for White himself in five short years. C.H. 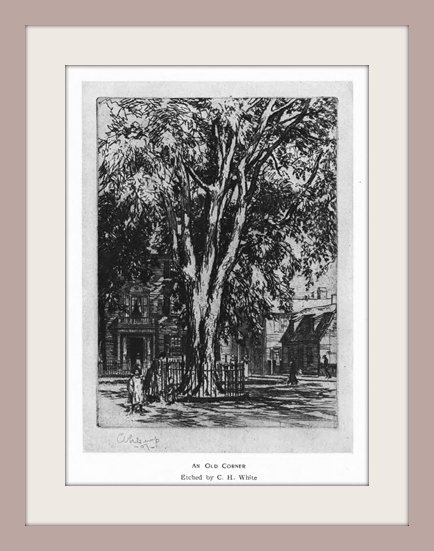 White, “Lower Salem” and “An Old Corner”, Harper’s Monthly Magazine, June, 1908. Because I dislike Presidents Day so much (because of its ahistorical morphing of all the presidents together, thus denying their individual achievements, as well as the fact that it never seems to occur on the actual date of either Washington’s or Lincoln’s birthdays, the particular presidents it claims to commemorate), I’m going to downplay the historical and emphasize the material today with a very brief examination of Presidential china. The morphing of presidents is a very popular pastime today (see this viral video), but I prefer not to morph. I spent (another) snowy afternoon looking through two books (Official White House China by Margaret Brown Klapthor and Susan Gray Detweiler’s American Presidential China. 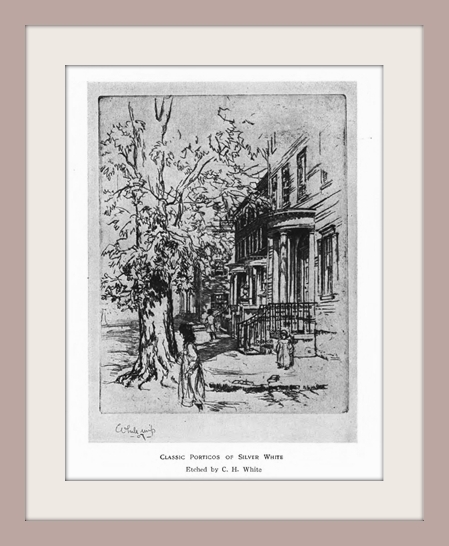 The Robert L. McNeil, Jr., Collection at the Philadelphia Museum of Art) and accessing two online sources (the White House Historical Association’s “Picturing the President’s House” digital series (so well done!) 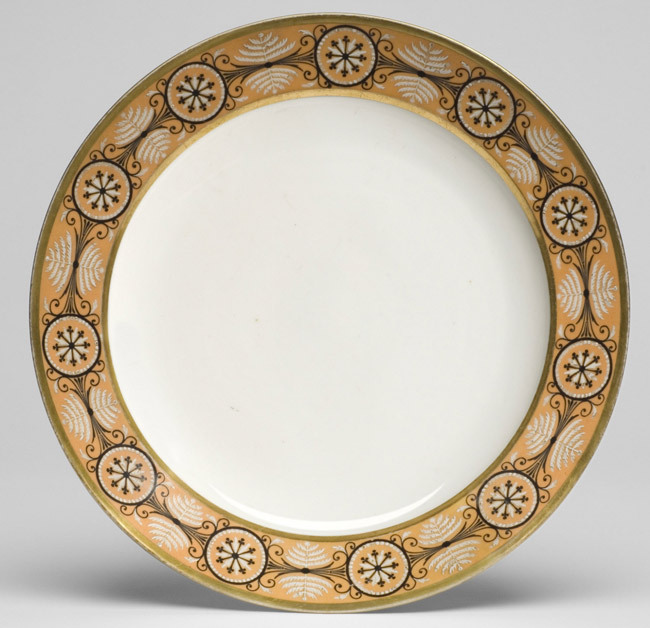 and the McNeil Americana Collection at the Philadelphia Museum of Art) and quickly formed an impression of presidential plates: those from the first century of the presidency are far more aesthetically pleasing and interesting than those from the second. Twentieth-century presidential china is, for the most part, boring. 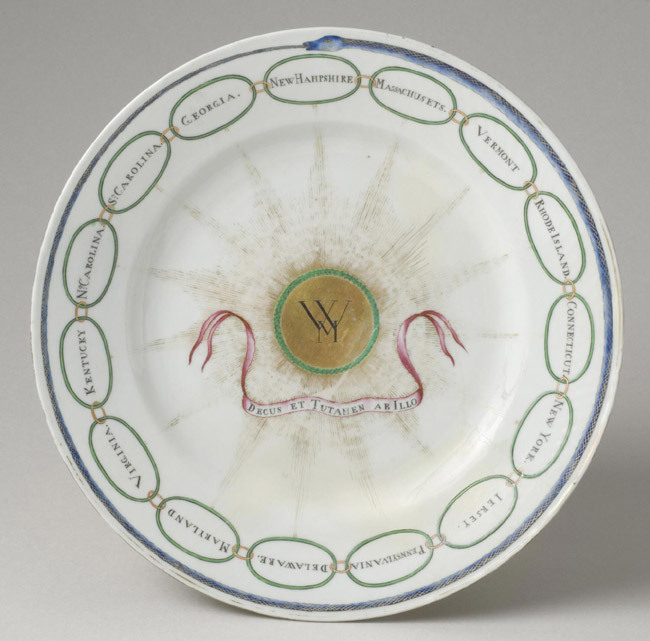 Here are some of the early presidential plates, starting with that of the Washingtons, a gift to Martha from Dutch East India trader Andreas Everardus van Braam Houckgeest, who commissioned the design in Canton, China. I love the chain of 15 states, the state of the union in 1796. 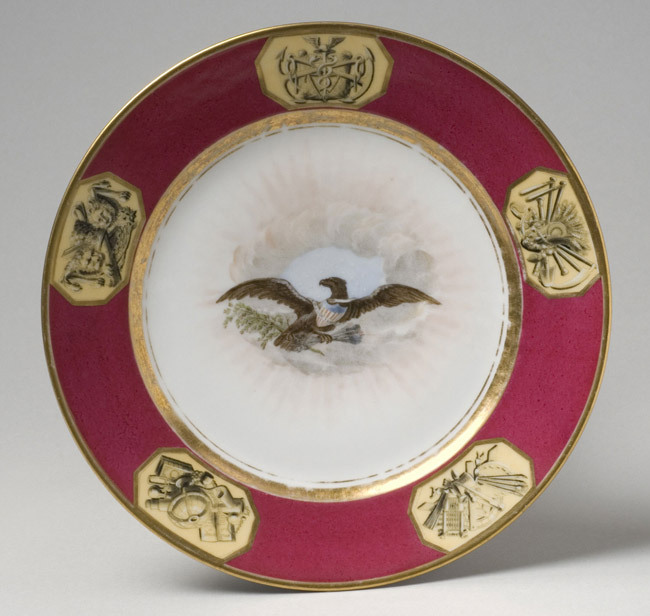 The service commissioned by James and Elizabeth Monroe from the French firm of Dagoty-Honoré is considered the first official White House china because of its patriotic motif: surrounding the eagle are five vignettes depicting Strength, Agriculture, Commerce, Art, and Science, the foundations of the new nation. 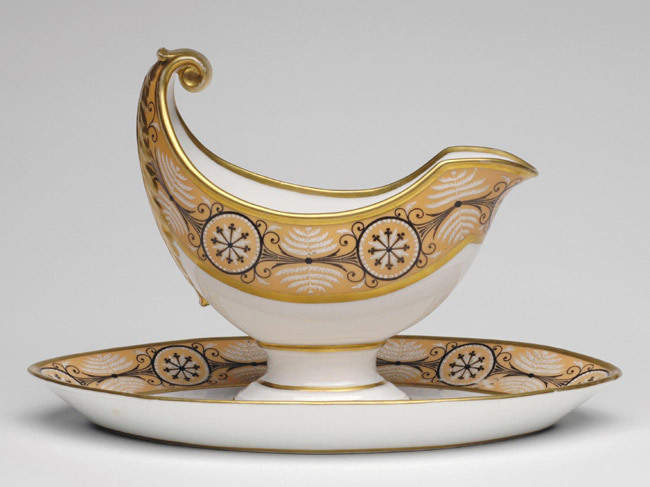 Successive presidents apparently used the large Monroe service (400+ pieces) for big state dinners but also brought their own china into the White House for daily use: Mr. and Mrs. John Quincy Adams used this neoclassical service (with seahorse motifs), likely manufactured by the La Courtille Factory in Paris and purchased during Mr. Adams’ earlier diplomatic service in Europe, during their time in office. Porcelain plates used during the Washington, Monroe, and Adams administrations, McNeil Americana Collection, Philadelphia Museum of Art. 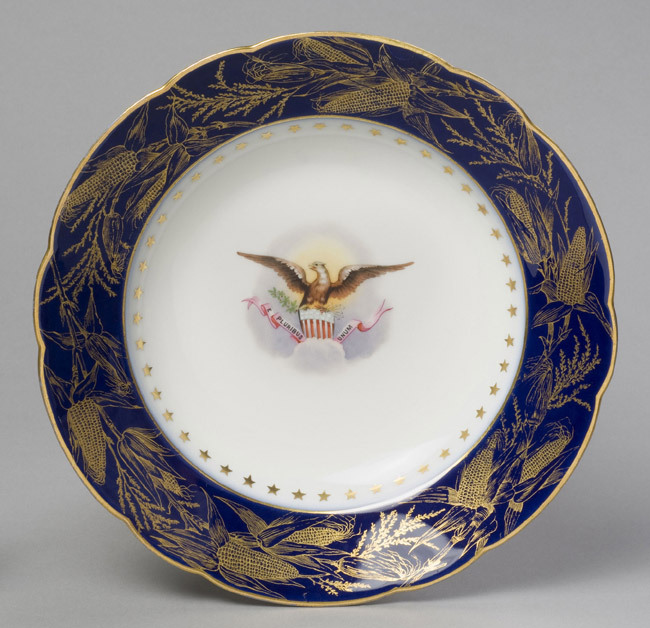 There is no doubt that the star of early presidential china was the set purchased by James and Dolley Madison from the Nast Factory in Paris: an absolutely stunning (and modern!) design featuring wheels, of all motifs. 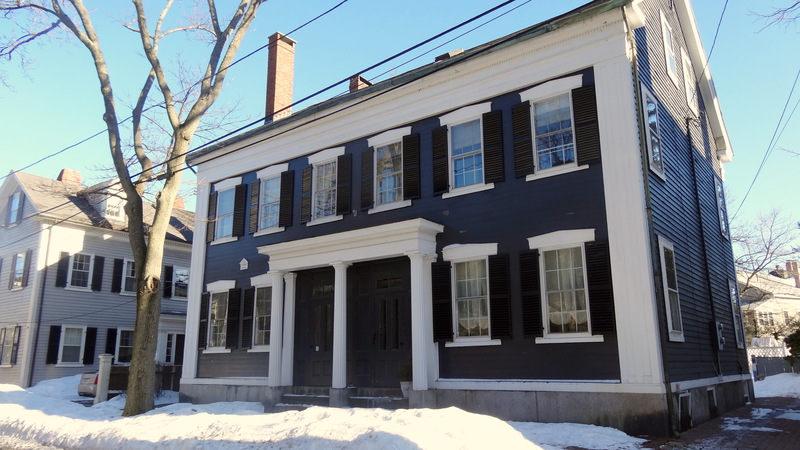 It seems to be very sought after; at first I thought this was because of its relative rarity, given the fact that the Madison White House was burned down by the British in 1814. But it seems like most of the service survived (did Dolley sneak it out in the last hours, along with that great portrait of George Washington? ), so I think its value must be based on the unusual design. I love it, and am even tempted to buy a copy–nearly every presidential library’s shop, including the JFK Library here in Massachusetts, seems to offer reproduction presidential china produced by Woodmere. 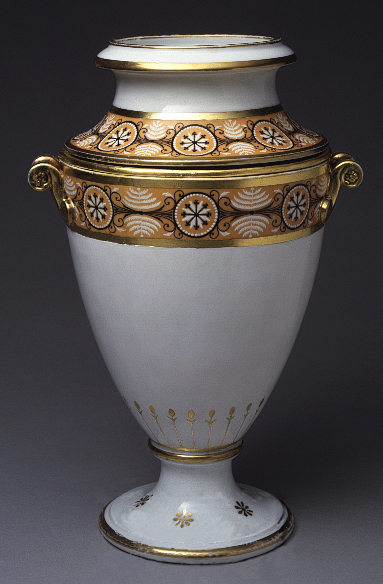 The Madison China, purchased c. 1806 from the Nast Factory in Paris. Plate and sauce boat, Philadelphia Museum of Art; dessert cooler, White House Historical Association. 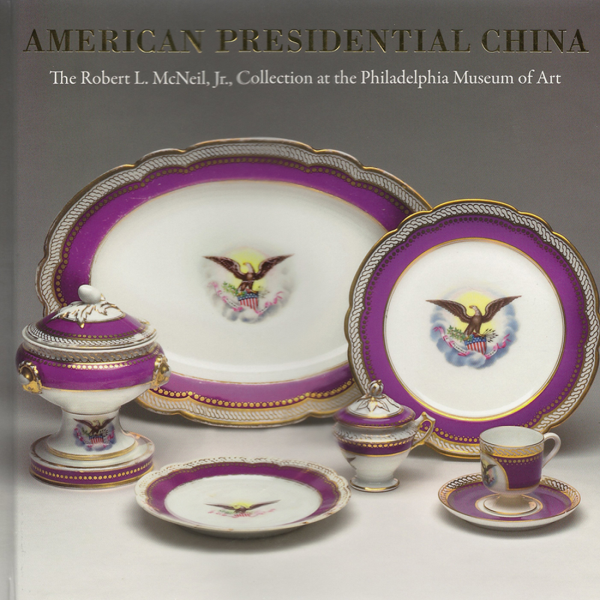 The Lincoln “Royal Purple” china, pictured below on the cover of Detweiler’s book, was certainly expensive, like most of Mary Todd Lincoln’s White House “improvements”, but it seems to have stood the test of time and was supplemented and complemented by later sets. 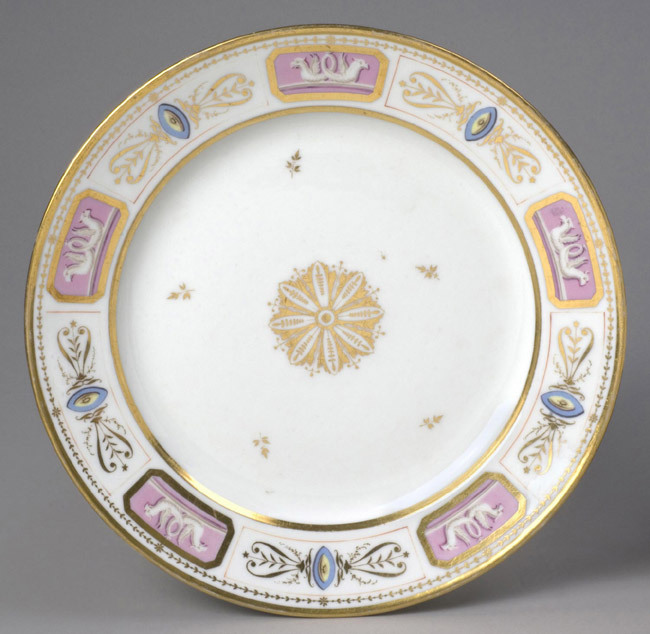 The scalloped shape set it apart from its predecessors, and like all White House china commissioned before 1918, it was made in France, by Haviland. In terms of their china choices, the two most innovative, or nationalistic (as well as naturalistic), first ladies were Lucy Webb Hayes and Caroline Harrison. 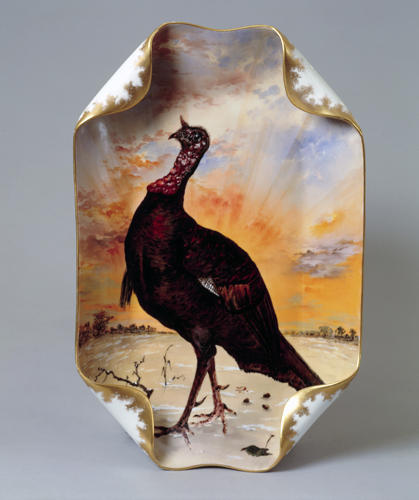 Quite by chance, Mrs. Hayes met an artist and reporter for Harper’s Weekly named Theodore R. Davis who convinced her to use native American flora and fauna in the design of a new White House service in 1880; the end result, designed by Davis in collaboration with the Haviland Factory in Limoges, France, was a rather dramatic departure from the traditional styles of the mid-nineteenth century. 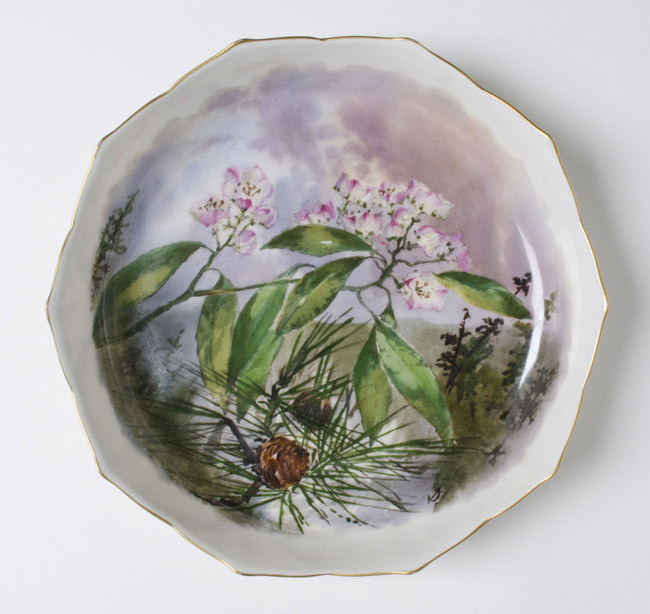 A decade later, Mrs. Harrison incorporated the naturalistic theme in her own design, but also paid tribute to tradition with the eagle and stars, and to Mrs. Lincoln’s plates with the scalloped edge. Soup plate and serving platter from the administration of Rutherford B. Hayes, designed by Theodore R. Davis in collaboration with the Haviland Factory, Limoges France, 1880, Philadelphia Museum of Art and White House Historical Association; A soup plate designed by Mrs. Benjamin Harrison (Caroline Lavinia Scott) and manufactured by Tressemanes and Vogt, Limoges, France, 1891. With the arrival of the twentieth century we come to the era of domestic production (mostly by Lenox) and rather boring bands: lots of gold, along with blue (Roosevelt), green (Truman and Bush), red (Reagan), and yellow (Clinton). The only departure from these restrained designs seems to be the Johnson wildflowers. 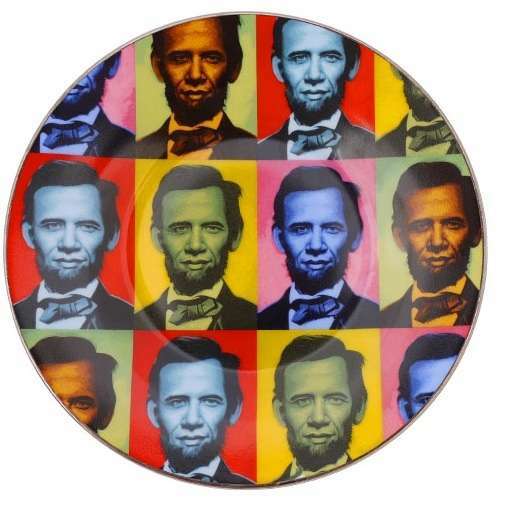 I’m not sure what the Obama plans are regarding china, but in the mean time, we do have the “Abraham Obama” tea set by Ron English ( I suppose I am engaging in a little bit of presidential morphing after all) and you can also custom order your own flowered presidential plate here; I might go for Teddy Roosevelt myself. 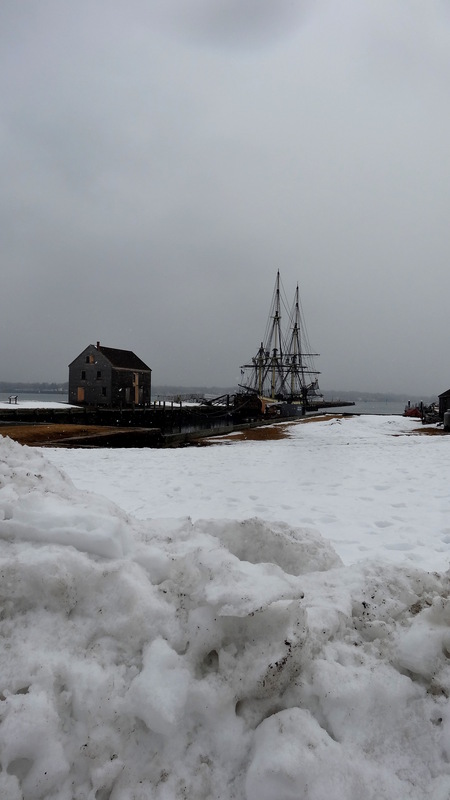 Well, it wasn’t the most beautiful day in Salem yesterday but there were lots of interesting things to see while walking around town. 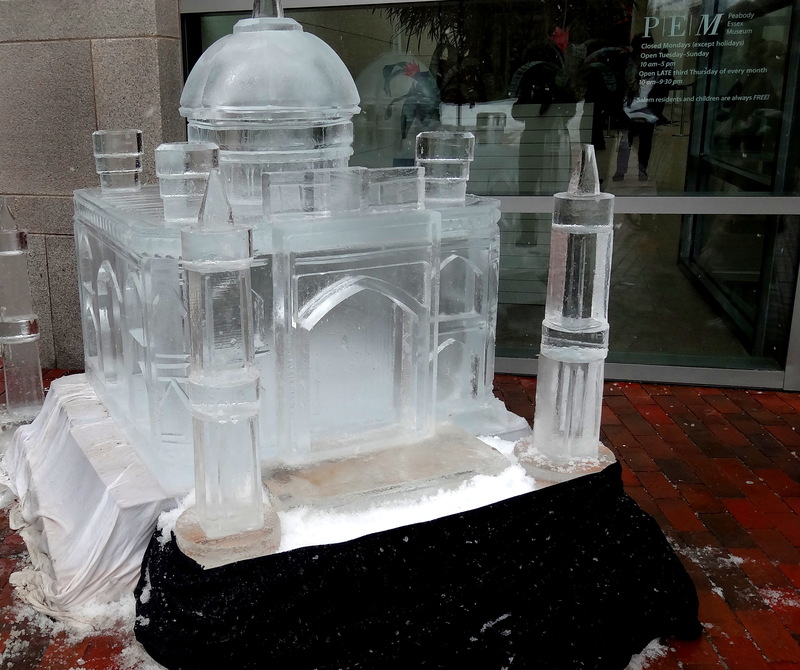 Slushy snow fell from the grey sky onto the wet streets, but there was contrast in the form of ice sculptures from the annual Salem‘s So Sweet midwinter festival, the architecture and shop windows, and a tranquil pair of swans at Pickering Wharf. As much as I love my native New England, this time of year can be rough; for me the urban environment provides a bit of relief from the starkness. 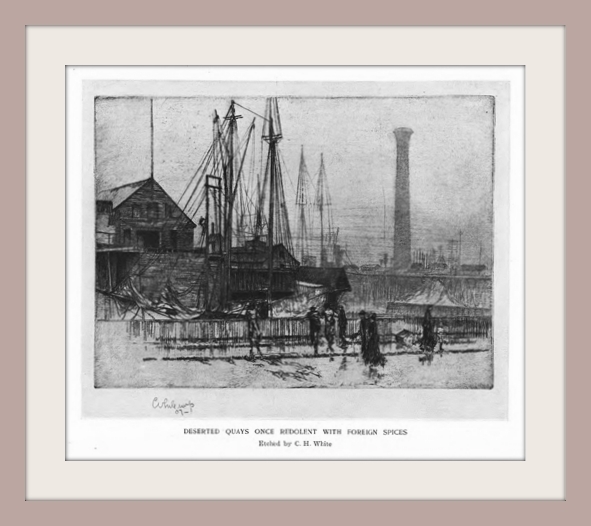 Derby Wharf and The Friendship yesterday, the Custom House, and the windows of the Modern Millie vintage clothing store on Central Street and Witch City Consignment on Essex Street. 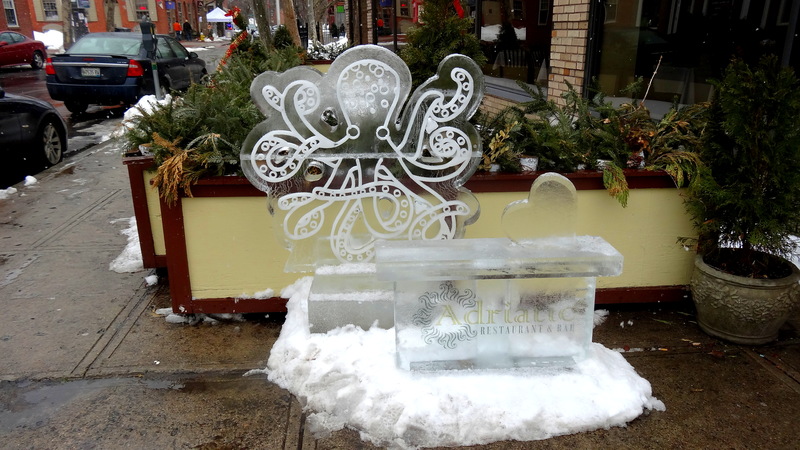 The Salem’s So Sweet festival, focusing on chocolate and ice, is an initiative of Salem Main Streets and the Salem Chamber of Commerce; there is a very popular wine and chocolate tasting event followed by a weekend installation of ice sculptures sponsored by local businesses and institutions. 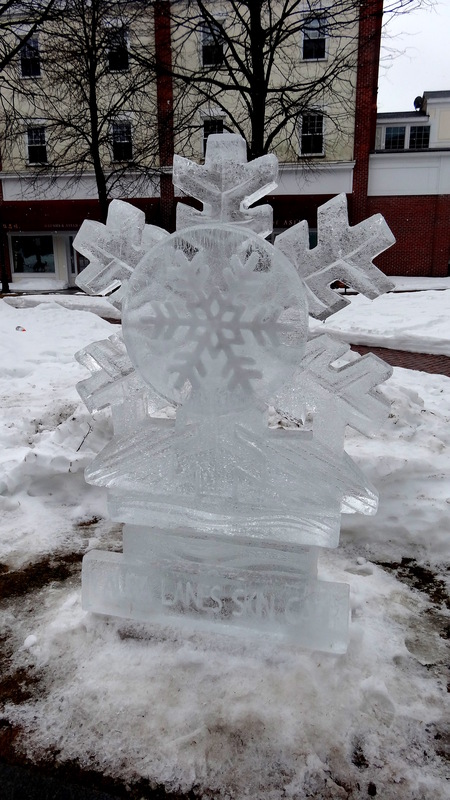 Everything has been delayed a week this year because of last weekend’s blizzard, but yesterday morning all the sculptures were on the streets of Salem. 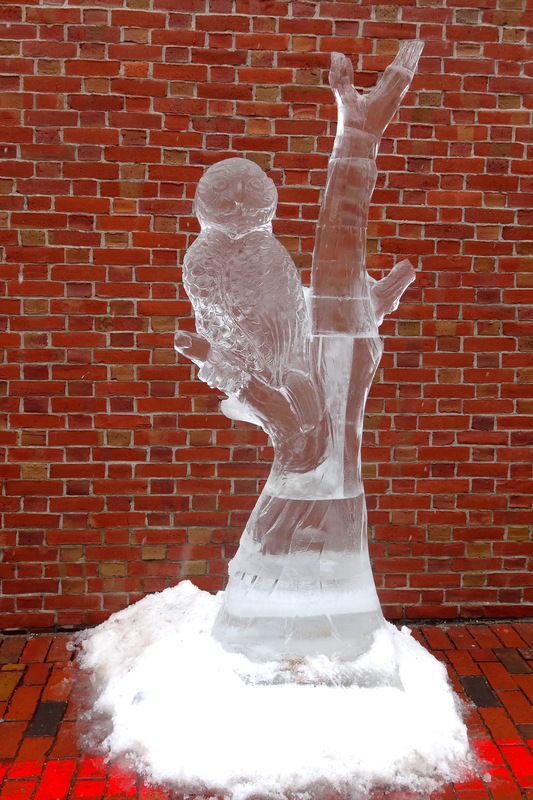 There was a beautiful sculpture of the Friendship at Pickering Wharf, which my camera somehow did not capture, and the Peabody Essex Museum’s Taj Mahal (which the sculptors were still working on) and a snowy owl sponsored by a consortium of Salem businesses (Pamplemousse, Modern Millie, Mighty Aphrodite, the Salem Trolley and Trolley Depot) and were my other favorites. The Peabody Essex Museum has enhanced the rather bleak landscape of Essex Street (all the shuttered tacky witchcraft-related shops are depressing even on a bright sunny day, much less a grey one, and the perpetually misspelled Witch Tee’s sign never fails to annoy me) not only with its Taj Mahal sculpture (to complement its current exhibition, Midnight to the Boom: Painting in India after Independence) but also with colorful placards on the construction fence surrounding its latest phase of expansion. 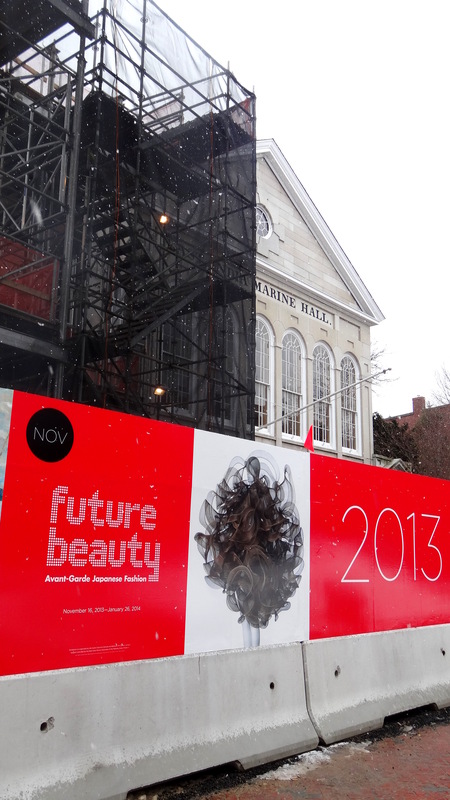 Images of the coming year’s exhibitions work as street art for me. 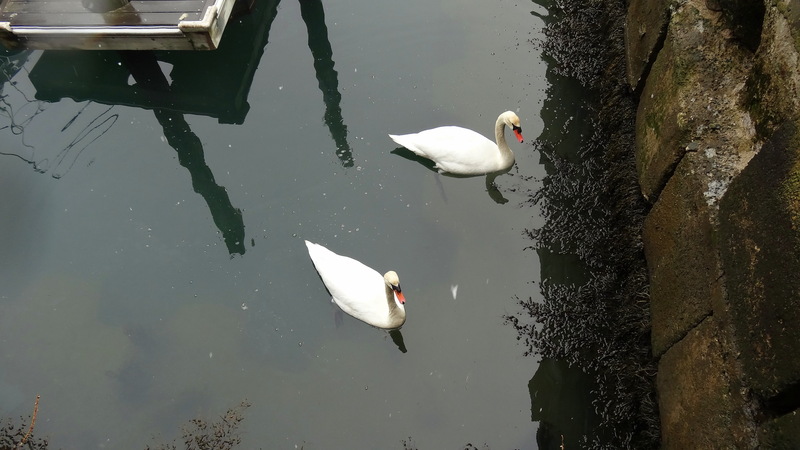 And then there were these amazing swans at Pickering Wharf, gliding around (with their big webbed feet) in the company of rather less majestic ducks, very close to the dock. They were a pair, of course.